I am making progress. It’s frustratingly slow. At least I am making some kind of progress. 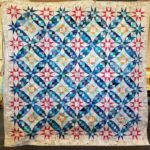 I am still at five quilts in 8 months. I know that Colleen has three, but I would still really like to have more off my UFO list. They don’t magically get done. I know the key is not to add anymore to my UFO list. Aqua-Red Sampler –This is on the design wall. I finished the last block, then decided it wouldn’t work. 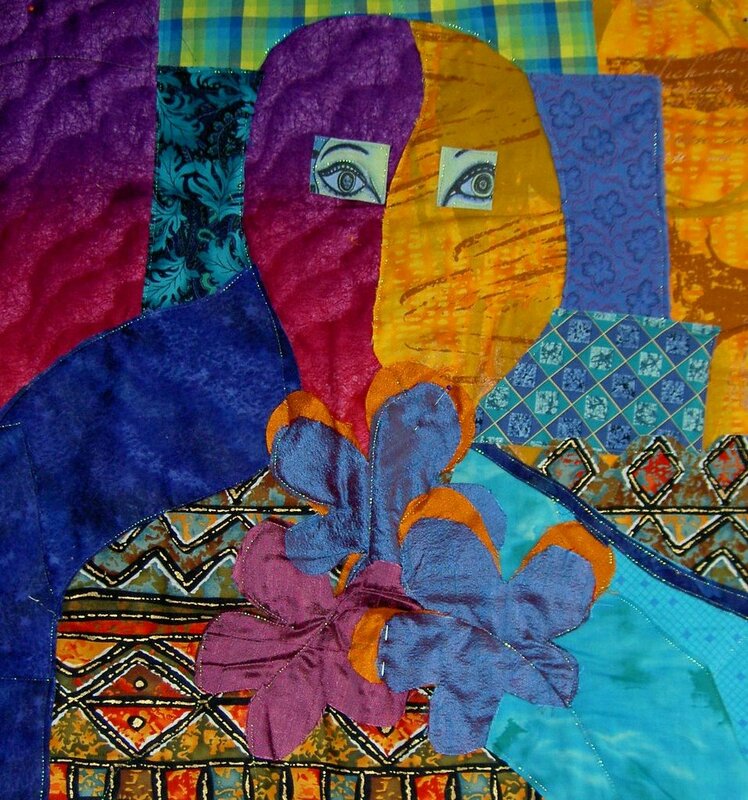 I have been fighting to get this quilt together, but I hope when you read this, it will be close to finished. Pies and Points from 2016 Victoria Findlay Wolfe class. Julie and I had a playdate towards the beginning of April. I brought this piece with me so I could cut more elements (Julie has a Sizzix). I am more excited about this piece now. I thought I had done more, but I couldn’t find more than 2.5 sewn together pieces. 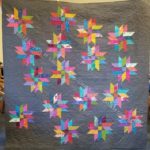 English Paper Piecing Project– half hexies – I have added about five stars. I also found some grey (did I buy it for this project or on spec?) that will be perfect for the border. Remember last time when I said I couldn’t find the diamond papers? I gave up and bought more. I haven’t actuallly made a border yet, but I have all of the supplies. I bought a template to go with the diamond papers. Joann at Paper Pieces was very helpful. City Sampler – blocks all made. The long term goal is to sash the blocks and put the top together. 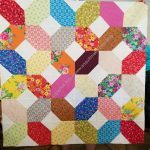 In the meantime, due to some seam allowance issues, some of the blocks are smaller than others, so I will have to adjust them in some way – either ripping and resewing, adding a piece or two to the block, or with sashing. I edfinish measuring all of the blocks so I can move on. My new sticking point is that I just need to deal with the problems. Sigh. Handbag Sampler – this is a project about which I had forgotten. The blocks were teaching samples when I taught a sampler class the time before I started writing the quilt class sampler tutorials. I found one block recently, but otherwise I actually don’t know exactly where the blocks are hiding. I have an idea and will crawl up in the far reaches of my fabric closet soon and see if I can find them. I haven’t even found a picture of all the blocks. Under the Sea: class project; like the design and am happier with the colors. I worked on it a couple of nights during Craft Night and am nearing the end of the stitching. All Rolled Up Tote – part of Crafty Gemini Organizer Club. I started cutting out the pieces yesterday at Sew Day. I made some progress, though I didn’t get it all cut out. 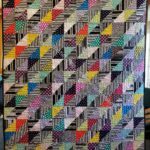 BAMaQG Color Round Robin– I took this to Colleen on my way to Sisters in July. Octagon 9 Patch: I took this to Colleen on my way to Sisters in July. BAMaQG IRR –The sandwich has been basted. 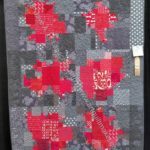 I machine quilted a couple of lines to stabilize it. I am making slow progress on hand quilting it using Big Stitch. 30 Something: I continue to cut 1.5 inch squares. I am pretty sure I have the 800 I need, but I am not ready to sew them together yet, so whenever I have a chance to cut more I cut more. It will give me choice when the time comes. I’ll have to think up a new name for this quilt, too. 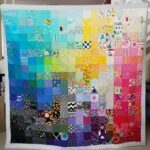 My next step is to figure out if I need to cut other sizes of squares and switch from cutting 1.5 inch squares to cutting the new size. I bought some fabric at Sisters and the Tula Pink dots and stripes after Sisters, so I am down significantly on net usage. Still gross usage is just over 130 yards. My net 40 yards. I would still be ecstatic if I could make it to 100 yards NET used by the end of the year, but I don’t think that is possible. I do have three quilts out at the quilter that could make my net number jump up, but 100 yards is a lot. It is good to have goals!